Birth, death, everyday occurrences and mysterious lights each have their place in this new collection of essays by retiree Louis Burl Houston. The book, released by Dog Ear Publishing, offers stories on a variety of topics, all relayed in a conversational, relaxed tone. 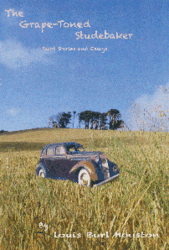 Dog Ear Publishing releases “The Grape-Toned Studebaker: Short Stories and Essays” by Louis Burl Houston. Author Louis Burl Houston began writing short stories and poetry when he was just 12 years old. The author grew up listening to his extended family and their friends tell stories as a form of entertainment. He went on to entertain co-workers with stories of his relatives, neighbors and other colorful characters and eventually began to write them down. This new book presents a selection of stories and essays on real events and people colored by the author’s observations and impressions of life. The book’s namesake story, “The Grape-Toned Studebaker,” features the tale of a new 1936 Studebaker President the author’s father bought. The car with the unusual paint job filled many roles – tractor, bulldozer, truck and dependable transportation – until its radiator and engine block cracked. Cheers turn into tears when the siblings see their father says goodbye. Essays like “Warts and Three-Legged Dogs,” “Walker Had an Audience” and “Taking Things Literally” showcase the author’s humorous side. Houston’s stories include brushes with celebrities. “Elvis Ate My Hamburger” describes when Louis met a young Elvis Presley, who was performing in town, and the lunch where the singer asked to eat his hamburger. In “Almost Meeting Mahalia” he describes his quest to meet the singer Mahalia Jackson, foiled when she has a near-fatal heart attack. Houston also isn’t afraid to tackle controversial issues. For instance, “My Friend Ben” shows the ugliness of bigotry two elderly drugstore owners have for a black shoeshine man, and “A Voice for Small Rivers” describes pollution’s devastating effects on waterways. Author Louis Burl Houston began writing short stories and poetry when he was just 12 years old. After retiring, he was chosen to write a weekly column for the Siloam Springs Herald-Leader newspaper. His column, which has appeared for two and-a-half years, features stories that make people think, cry and laugh. He and his wife, Leah, have two sons and two daughters. For additional information, please visit http://www.grapetoned.com.